The Medscape Physician Compensation Report 2018(www.medscape.com) surveyed more than 20,000 physicians in the United States between Nov. 21, 2017, and Feb. 21, 2018. It found that family physicians received an average of $219,000 in total compensation, compared with $209,000 in the previous year’s survey(www.medscape.com). The average compensation for all physicians was $299,000, about 2 percent higher than the prior average of $294,000. The highest-paid physicians were plastic surgeons at $501,000, followed by orthopedists at $497,000. Physicians specializing in public health and preventive medicine received the lowest average compensation at $199,000, followed by pediatricians at $212,000, although both groups saw an increase in their pay. Psychiatrists saw the largest increase of any specialty, with their average compensation increasing 16 percent to $273,000. Researchers attributed the significant gain to an exploding demand for mental health services, particularly among the aging population and those struggling with opioid abuse, while the number of psychiatrists has not kept up with demand. Among family physicians, 61 percent said they were fairly compensated, an increase from 53 percent the year before. Overall, 55 percent of physicians said they were fairly compensated, with emergency medicine physicians (74 percent) the most satisfied and physical medicine and rehabilitation physicians (46 percent) the least. The states with the highest average physician compensation were Indiana ($334,000), Oklahoma ($330,000), and Connecticut ($329,000). Maryland ($256,000), New Mexico ($261,000), and Hawaii ($268,000) had the lowest average compensation. The survey showed a continued trend among physicians to practice in employed settings rather than striking out on their own. Sixty-nine percent of respondents said they were employed, while 26 percent said they were self-employed. By comparison, 63 percent said they were employed and 32 percent said they were self-employed in 2014, the last time the survey disclosed results for all respondents. Self-employed physicians continued to make more than employed physicians, however. Family physicians were slightly less sanguine about the profession in this year’s survey compared to physicians in general, with 73 percent of family physicians saying they would choose medicine again as a career versus 77 percent for all physicians. However, 73 percent of family physicians said they would choose their specialty again, well above the 62 percent of overall respondents who said they would choose their own specialties again. After shrinking in recent years, the gender pay gap for primary care physicians widened with male physicians ($239,000) making an average of almost 18 percent more than female physicians ($203,000). The survey has become slightly more detailed this year in tracking the growth of physicians pursuing alternative payment models, although they still remain a distinct minority. Thirteen percent of respondents said they operate in a direct primary care practice, 5 percent said they operate a cash-only practice, and 2 percent operate a “concierge”-style practices. 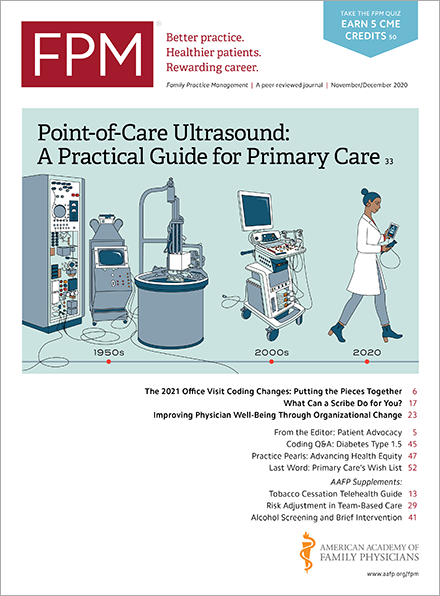 The percentage of physicians who said they participate in an accountable care organization shrank from 36 percent a year ago to 27 percent, which researchers said reflected concern that the model has yet to consistently increase efficiency and improve outcomes while achieving shared savings.